The Upside-Downside Volume indicator shows the difference between up (advancing) and down (declining) volume on the New York Stock Exchange. The Upside-Downside Volume indicator shows the net flow of volume into or out of the market. A reading of +40 indicates that up volume exceeded down volume by 40 million shares. Likewise a reading of -40 would indicate that down volume exceeded up volume by 40 million shares. The indicator is useful to compare today’s volume action with previous days. Currently, normal readings are in the area of 50. Very active days exceed 150 million shares (the October, 1987 crash reached -602). 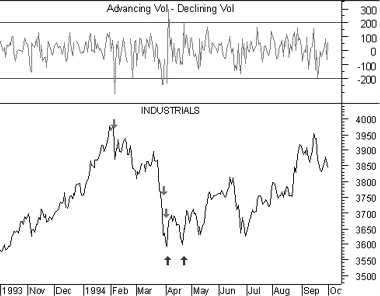 The Cumulative Volume Index is a cumulative total of the Upside-Downside Volume indicator. The following chart shows the Dow Jones Industrial Average and the Upside-Downside Volume indicator. I labeled the DJIA with “buy” arrows when the Upside-Downside Volume indicator was greater than 200 and with “sell” arrows when the indicator was less than -200. The Upside-Downside Volume indicator is calculated by subtracting the daily volume of advancing stocks by the daily volume of declining stocks.